Hi friends! Today's post is from one of my favorite bloggers, Kelly from Kelly Cox at Home. She is by far the most positive person I know and I am totally inspired by everything she writes! 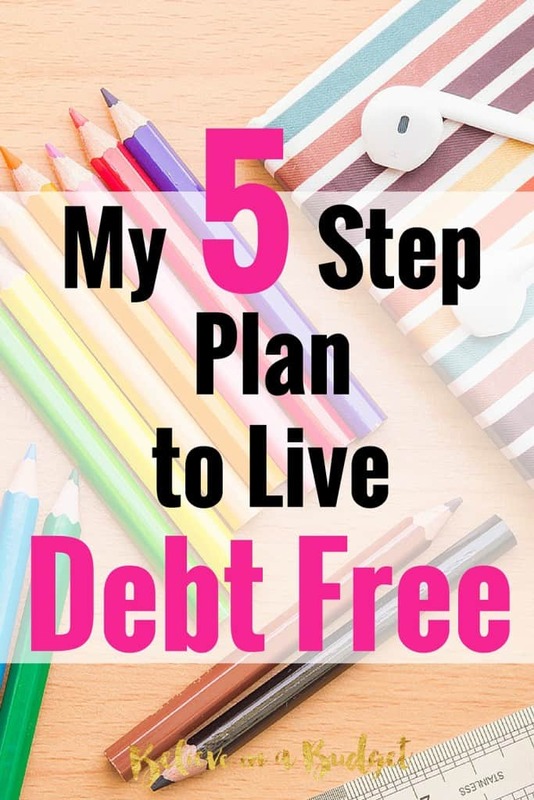 Today she's sharing how we can all become debt free, which is something many of us hope to accomplish! Debt is painful and restrictive. Most of us have been there at some point or another. People just accept debt as “part of their family” and just go the way of the culture. There is a better way. I believe in a budget and that debt-free living is attainable. Imagine dumping the debt and having financial freedom! Change is necessary if you want to live free from debt. Dave Ramsey says, “Change is painful. Few people have the courage to seek out change. Most people won’t change until the pain of where they are exceeds the pain of change.” Are you there yet? Is the pain from debt so bad that you are ready for a life change that will result in greater freedom? If so, then you are ready for my 5 Step Plan to Live Debt Free! You must immediately adjust your lifestyle to below your means. This is actually a simple concept in that you need to spend less than you make. Get creative and find ways to live on less. I’d suggest taking your lunch to work, skip the coffee shop, turn down some of the weekend invites and skip a few mall trips. Also, refuse to take on anymore debt. In other words, don’t buy anything if you can’t pay with cash. You’ll quickly learn that a budget is your friend! My husband and I have lived by our budget since the beginning of our marriage and are now enjoying the fruits of our labor. We are debt free. Sticking to our budget, we learned how we really spent our money and were inspired to save more. A budget helps you to plan, save and work toward your financial goals. For example, we are in the process to adopt our first child and our budget helped us to be able to do this without accruing any debt. Budgets tell your money where to go rather than wondering where it went. Pay off your smallest debt ASAP. If you have one less thing to pay down, then you’ll be motivated to keep going. Plus, you’ll have one less check to write each month which is quite freeing. Here are a few ideas to make a little extra money to help you pay off that smallest debt quickly. Getting out of debt can be tough and a little encouragement and inspiration will go a long way. If you start with your smallest debt first, then you’ll see progress more quickly. We never plan to fail but often we fail to plan. An accountability partner helps you to stay on track with your goals. If you are married and have the goal to live free from debt, perhaps you and your spouse could hold each other accountable. If you are single, share your goal with a friend or family member and set up checkpoints to discuss your progress. Accountability often provides you with the much needed support and encouragement to keep you stay on track. No need to go this thing alone! A reward system makes paying down debt a little less “painful.” I encourage you to set a few benchmarks as you work toward your goals with incentives to keep you inspired. When you hit these mini objectives, then celebrate! Do you want to go for coffee with a friend, try a new restaurant or buy a new pair of shoes? Enjoy something that is reasonable and fun for you! A little celebration will help spur you onward. Living free from debt is a worthy goal that requires change and hard work. Don’t just accept debt as a part of life! I encourage you to live below your means, create a budget, pay down debt, find accountability, and then celebrate as you pull of your financial goals. This 5 step plan works. If I can live debt free, then anyone can! What is one way you have started to reduce your debt? Kelly is a Christ follower, blessed wife, mom to be and a lover of all things home. She blogs over at Kelly Cox at Home about her journey at home and passion for debt-free living. She hopes to encourage others in that goal, while sharing tips on how to manage and enjoy all things that make up HOME! Follow along with Kelly on Facebook, Pinterest and Twitter. Budgeting is the key to success when it comes to debt free living. Kristin has an inspiring story and truly “Believes in a Budget.” Glad you liked the post and YES check back on this site! This is a great and enlightening post! I could not agree more with #2. I believe organization is the key to success and nothing says “organization” quite like making a budget. Thank you for the post, I will be checking back at this site quite often! We love Dave Ramsey. We are completely debt free from his teachings. Our goal is have all of our children debt free through college. Great advice! Beth, we are Ramsey fans too. I love that he pulls in what scripture says about money. That is a great goal to pay for your kid’s college debt free. I wrote a post on my site about how I paid for my 4 year degree without any debt. I worked hard and God blesed my efforts! It’s worth it. What great tips! I like the idea of paying smallest debt first unless you have one card or debt with a crazy high interest rate. That can kill you! !